My 4th election, 2nd presidential election. I couldn’t even tell you how many primaries, debates, etc. without hitting Wikipedia and counting. 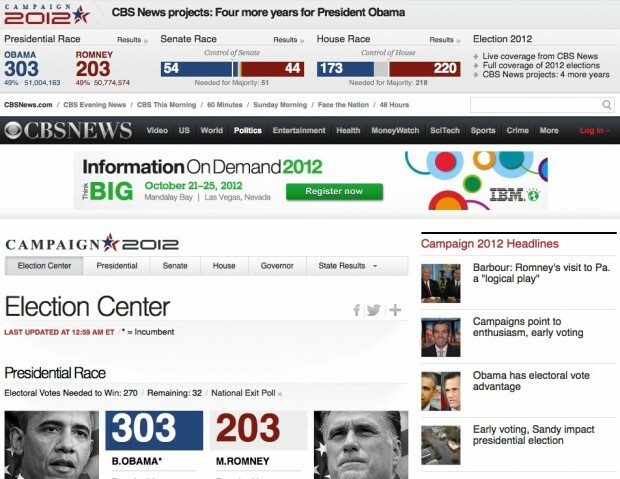 Handling the technical side of elections on a large internet news presence is nothing short of crazy. It’s a lot of 1’s and 0’s to move across the internet in a very short amount of time. No margin of error, no time to recover from mistakes. You’re product launches with the firmest of deadlines and is consumed immediately. Scale later is not an option, you scale from the starting gate to handle an unknown number. It’s an interesting experience no matter how many times you do it. No matter how much planning, quick thinking and judgement calls are unavoidable. At least there’s a 2 year break until the next one :).